Heat sealers table top -are available as table top rotary band sealer, table top impulse heat sealer and constant heat sealers. Also table top blister sealers, table top tray sealing machine, and table top heat seal presses. Table top heat sealer models that are validatable for medical sealing of Tyvek medical packaging. A custom table top heat seal press, medical tray sealing machine, for sealing medical packaging with thermoform trays is also available. The table top heat sealers are industrially harden -reliable and durable. The table top industrial impulse heat sealers are as 15”, 20” and 25” wide heat seal bar models. The medical heat sealer has a stainless steel body. 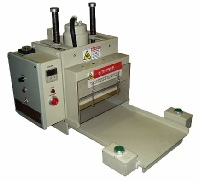 The industrial heat sealers have a powder coated steel body, or optional stainless steel. Air operated semi-automatic operation of the heat seal jaws. All table top heat sealers are made in USA.